The picks and round one standings for this year's second major are up on the site. We chose 29 golfers. Adam Scott is the favorite, one short of unanimous. Rory is the #2 favorite pick, showing up 13 times. Young Jordan is on 12 teams. Eleven of us think Phil will make a run at the career grand slam. Kuchar was chosen 10 times. Bubba got the nod 7 times. Rose is the only 4-bagger. The treys include Dufner, Furyk, Kaymer and Matsuyama. Westwood, Simpson, McDowell and D.J. are deuces. Fourteen uniques. Brett, Bill and Dave A. have 2 each. Dan, Chris, Shelley, Steve, Jordie, Dave B. and both Mikes have one each. 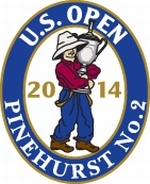 Somehow Randy, Brian, Hugh and I missed out on a Pinehurst unique.